If you’ve been here for a while, then you are familiar with the Marshmallow Challenge that I’ve done a couple of times. Both of the previous times it’s been attempted in Rm. 202, though, it’s been with 5th graders. Well obviously I don’t have any of those anymore, so I wanted to see how my 2nd graders would rock this challenge. Now, I must add that since most of us were here together last year, we had a little bit of an advantage, rather than doing with people who are relative strangers. The activity, however, was new to everyone. I put everyone together in our new Room Teams, and their first job was to create a name for their team (which is new for us–last year we just went with numbers). They were super creative, and came up with GREAT names like Cherry, The Blue Angels, The Legendary Black Dragons, The Golden Girls and the Lion Kings. Cool, right? Once I said “GO” the fun began and the teams tried to create the tallest free-standing tower they could. 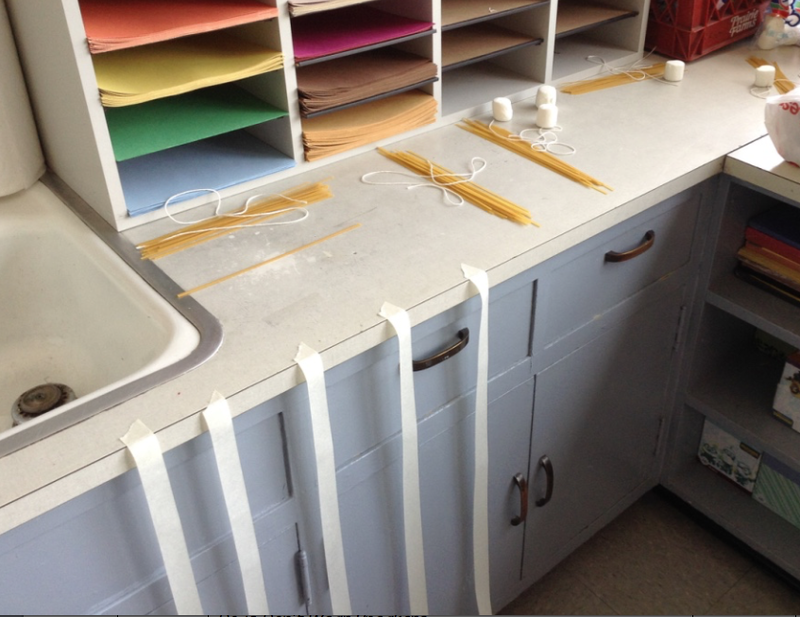 I was SUPER impressed with how well each team worked together and also with how they built on each others’ ideas. Our conversation after the challenge was perhaps the best part. We could have said that most groups failed and that just the tower that stood was successful, but we were not ok with that. 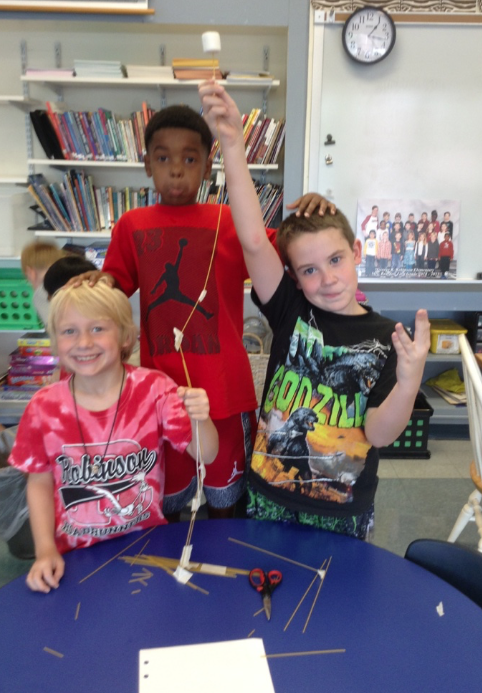 We agreed that we had many points that proved that we were successful in spite of the fact that our towers fell over. We had focused on the process and the product was not the biggest deal. We have come back to this chart already a couple of times, too, and used some of the plusses for other activities together! We’re excited to try again! 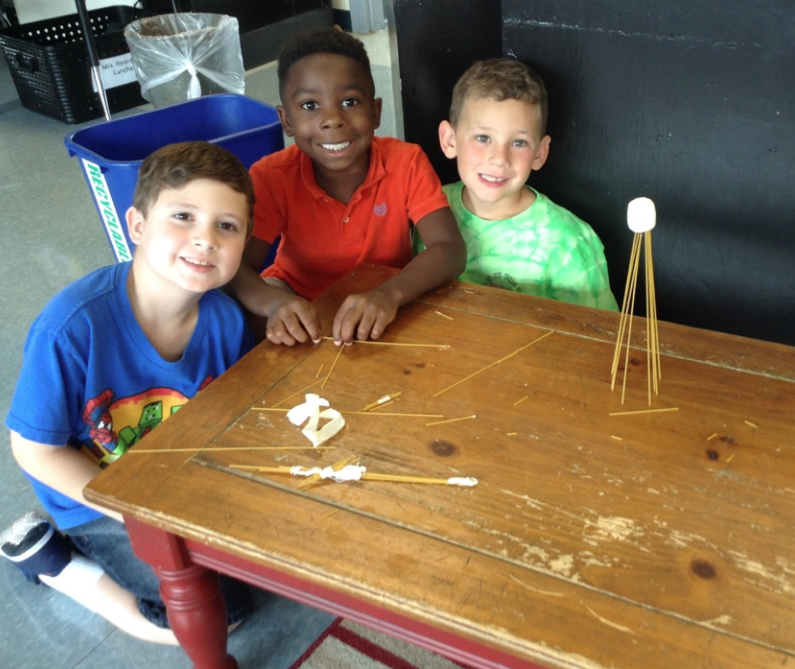 Posted on August 22, 2015 by Jen Bearden	• This entry was posted in Classroom, Play, Second Grade, Social Studies and tagged back to school, community, fun, marshmallow challenge, reflection, second grade. Bookmark the permalink. Cool! I know some 5th graders that will definitely be trying this on their own soon. Good job Lion Kings! A lot harder than you would think I’m sure. Great activity! Don’t you love how that turned out for them? They put in a lot of good effort for sure! SO glad to have these fabulous kiddos back together again this year. 🙂 Thanks for your comment!